Brussels chief rabbi describes fear in the streets following terror attacks, says he understands why Jews leaving the EU in droves. 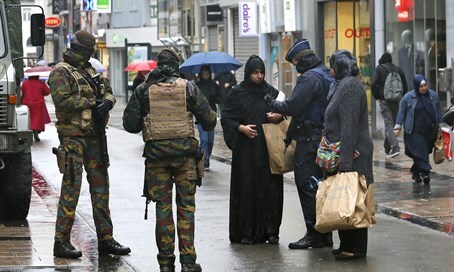 The Islamic State (ISIS) attacks in Paris have proven not only to be a wake-up call for the French, but also for Belgian Jewry, Brussels Chief Rabbi Avraham Guigui stated Monday. "There is fear in the streets," Guigui said, in an interview with Israel's 103FM radio. "Belgians realize that they are targets of terrorism." "Jews are praying at home. Some of them are planning to leave," he noted. "On Shabbat they closed the synagogues in the city; that has not been seen since World War II. People are praying alone, or setting up small congregations in private homes." "Schools are closed, the cinemas are closed, the big stores are closed for the most part, public events are not being held," he added. "We live in fear and wait for the police or the government to update us on the situation." "The reason for all this is that the government says that terrorists could carry out attacks," he reflected. Belgian police have cracked down on Islamist terrorism over the past two weeks, after the terrorists in the ISIS shooting and suicide bombing spree in the French capital were revealed to have been of Belgian origin. "As Jews, we already know the situation and know what terrorists are like," Rabbi Guigui added, reflecting that the attack on the Jewish Museum in Brussels was just over a year and a half ago. "Until today the Belgians thought that terrorism threatens only the Jews or the police, [but now they] understand that [any] Belgian can be a terror target. Anyone and everyone can be a victim of jihadists." "There's fifty thousand Jews in Belgium," he continued. "Twenty-five thousand in Brussels, eighteen thousand in Antwerp and the rest in Charleroi and other places." Most Belgian Jews are fleeing to Israel, Canada, and America. "People realize there is no future for Jews in Europe," he lamented. "There is also an economic recession that pushes young people to leave Belgium to go to Israel or to go to other places." But the rabbi refused to be bitter about the mass emigration - particularly to Israel. "I believe Israel is important to every Jew," he said. "This is something that Jews throughout the ages aspired to achieve." "But, you can't leave out of fear," he qualified, noting that such a move rarely instills a successful absorption, "because there is always the feeling you left something behind." "You should make Aliyah out of a love for Israel."